The Hotel is a Large Victorian Building built in 1895. Set in the middle of the Seaside town of Lossiemouth, the Hotel has stunning views over the Moray Firth and is only a 5 minute walk from the 2 beautiful sandy beaches. Across the road from the Hotel is the Royal Moray Golf Course which boasts two 18 Hole Courses one of which is a Championship course. Perched above Moray Golf Course and looking out over the Moray Firth, the Skerry Brae Hotel & Restuarant, Lossiemouth, Moray, Scotland nearby the local airbase of RAF Lossiemouth. There are 19 rooms all with ensuite facilities, digital television, hair dryers and tea/coffee making facilities. Norland Bed and Breakfast is a family run, friendly and warm B&B, based in Stotfield Road, Lossiemouth overlooking Lossiemouth's west beach. There is a choice of 4 comfortable rooms to suit requirements, 3 double/twin, one family. Each room has en-suite facilities, tea and coffee making facilities and a flat screen television. 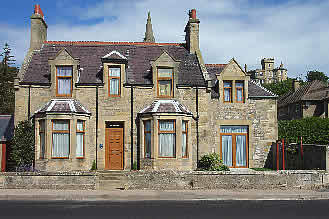 Situated on Clifton Road, Lossiemouth, Ceilidh Bed and Breakfast is a Scottish Tourist Board 3 star accommodation. The bedrooms are en- suite, with TV's and complimentary tea and coffee trays.